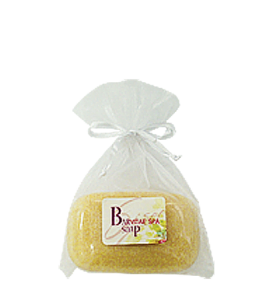 Pamper, moisturize, and tone your skin with our indulgent and luxurious BarVitae Spa Soap. Full of natural and nourishing ingredients like pumpkin seed oil, sweet almond oil, and Camellia japonica seed extract, our BarVitae Spa Soap is an indulgent and luxurious way to pamper, moisturize, and tone your skin. It’s free from harmful and irritating ingredients, has a clean, pure scent, and comes nestled in a charming organdy pouch, making it perfect for gift giving.